If you enjoy curbside mail delivery and you are thinking of customizing your mailbox, you might want to consider the genius of the customizable Whitehall mailbox and post package. On practically any given workday, most Americans make the routine trek from their car or home to their curbside mailbox. Out of those who are lucky enough to still get curbside mail delivery, only a few will consider customizing their residential post mount mailbox in order better meet their needs. Even before all the customizable features enter into the fray, The Whitehall mailbox and post package provides a distinct advantage over the standard mailbox. Larger Mailbox Size – Whitehall mailboxes start with 20% more mail storage room inside the mailbox, which means your mail is less likely to spill out onto the street. With 20% more room for mail, Whitehall customizable mailboxes provide the space you need inside your mailbox for a few days worth of mail. This can be very helpful if you are away on a short business trip or vacation. Alumi-Shield Coating – The Whitehall mailbox and post package also comes standard with the innovative Alumi-Shield coating on the mailbox exterior. This means that the finish on your mailbox is extremely durable and will help protect your mailbox to keep it looking just like you bought it, year after year. What attracts most homeowners to the Whitehall mailbox and post package is the customization available during ordering. Nearly every Whitehall mailbox ordered can be as different and as unique as it’s homeowner. Once the curbside mailbox finish and mounting system is selected, you can then choose how to display your mailbox address upon the Whitehall curbside mailbox so that mail is correctly delivered. Front mounted address plaque that displays your house number upon the door of the mailbox. And/or side address plaque in either one or two lines of copy that display the house numbers, street name, and even family name if so desired upon the sides of the Whitehall mailbox. 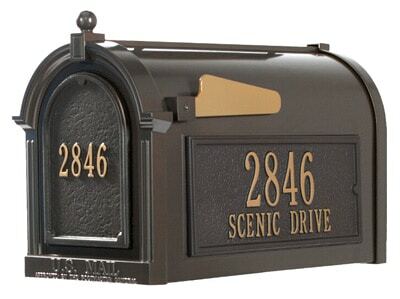 Another unique option to Whitehall residential mailboxes is the arched and mounted mailbox topper that can also display your house number and street address or your family name. 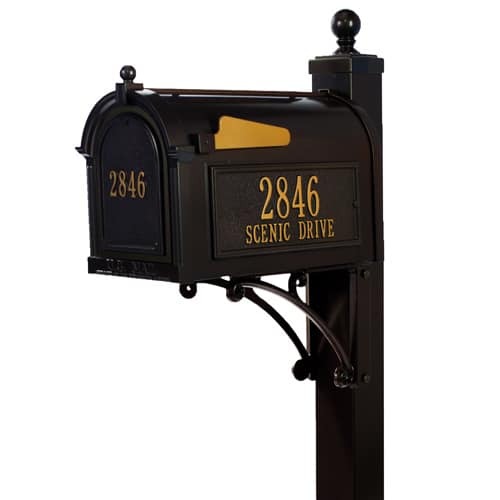 Mailbox Post Cuff – One of the most popular options on customizable Whitehall curbside mailboxes is the mailbox post cuff. The cuff slips over the mailbox post at the base (ground) level so that the unsightly intersection between post and ground can be discreetly covered up. Mailbox Newspaper Holder – A newspaper holder is also available to those who order the standard mailbox post configuration. The newspaper can be slipped easily into a sleeve that is mounted beneath the Whitehall mailbox. Only postal carriers can utilize the actual mailbox portion of the mailbox. 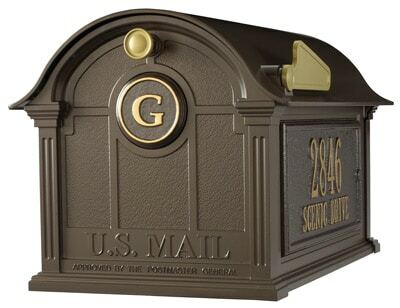 The mailbox newspaper holder is designed to avoid violating US Postal Service codes. The mailbox newspaper sleeve allows a legal and dual use of the mailbox post by providing a safe and legitimate place to deliver one’s daily or weekly newspaper. Located just outside of Chicago at 1743 Quincy Avenue in Naperville, IL, The MailboxWorks has been serving customers across North America since 1989. We are now one of North America’s leading online retailers for customizable mailboxes for residential and commercial use. To learn more about customizable Whitehall post mount mailboxes or for help placing an order, please call one of our mailbox experts toll free at 1-866-717-4943 or send us an email.